US Republican Katherine Harris - a Presbyterian 'pro-lifer' who treats animals like this! In rural Wassau in the southern US state of Florida, the Wausau Possum Festival has become an annual summertime folk festival over the past forty years. This event is said to celebrate the role of the opossum in the survival of the populace of Northwest Florida during the depression. Aside from the music, a key feature is the fundraising possum auction for the local Wausau Development Club, which involves holding opossums by their tail. Possum is served up as a main fare. The Virginia oppossum (Didelphis virginiana Kerr) is the only marsupial native to the south eastern region of North America and extending through Central America. 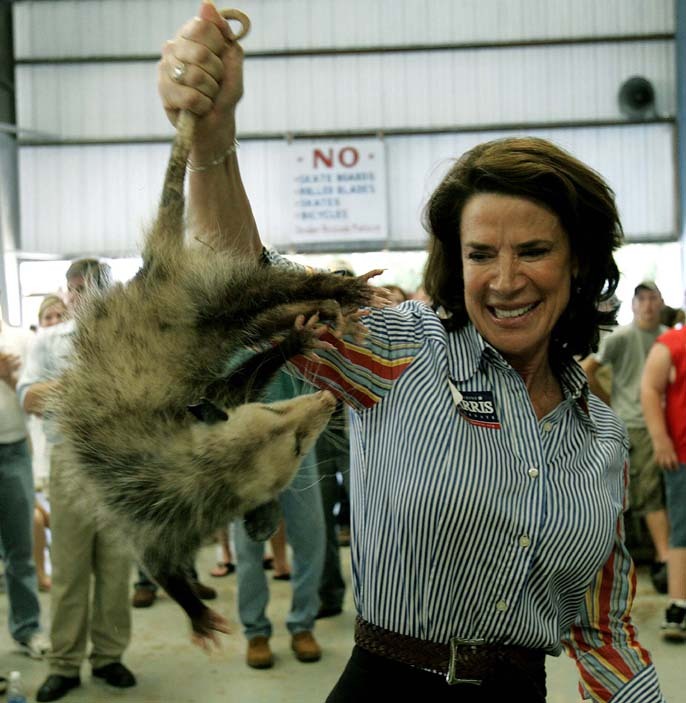 American Republican politician Katherine Harris of Florida is shown here in August 2006 during her campaigning for the 2006 Florida United States Senate election, holding a possum by the tail and is said to have bid $400 at the so-called 'possum auction'. According to the festival's sick tradition, every election year, national and statewide candidates in Florida must prove they are good country folk by mistreating a possum at the Wausau Possum Festival. "Candidates bid for a possum, taking it out of a holding area by its tail and giving it a shake to terrify the creature into going limp so it won't claw them. They're later fed and released into the wild. "Someone should pick her up by her nether regions and shake her until she goes limp. Then take her back to the woods." Cruelty to animals deems a jail sentence; not rewarded with an appointment to public office. This is sick. Anyone referring to this in cruelty in any form is not the sharpest tool in the shed when it comes to possums or the animal kingdom in general. I would also have pleasure in hanging this prolifer imbecile up by the scruff of her neck from a tree.. They hang from their tails in the wild dumbass. Very young opossums can hang by their tail briefly but adults cannot do it at all, they are just too heavy. Of course any opossum being held by its tail is going to be in distress whether it can support its weight or not. Anyone that cannot appreciate this is either ignorant, stupid, sadistic or all of the above. Cruelty? Really? Holding an oppossum by it's tail is hardly cruelty. It is a prehensile appendage, and they regularly support their full body weight with their tail. "Terrifying" an oppossum until it goes limp? That is their natural defense (playing possum...duh) and they hardly have to be "terrified" to do it. As for auctioning, and eating animals...the same thing happens to free range, ethically raised animals that people eat everyday. I don't know or care much about this woman's politics...I don't live in Florida. I just don't think this justifies an uproar simply because a political figure is involved.